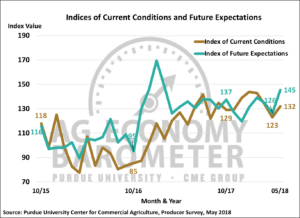 The May reading of the Purdue University/CME Group Ag Economy Barometer was 141, 16 points higher than in April 2018 and the highest barometer value since January 2017 (Figure 1). The rise in the barometer, a sentiment index derived from a monthly survey of 400 agricultural producers across the U.S., was driven both by producers improved view of current conditions and, especially, their more optimistic view of the future. The Index of Current Conditions rose to 132 during May, 9 points higher than in April while the Index of Future Expectations climbed to a reading of 145, 19 points higher than a month earlier (Figure 2). This was the highest future expectations reading since February 2017. Figure 1. Purdue/CME Group Ag Economy Barometer, October 2015-May 2018. Figure 2. Indices of Current Conditions and Future Expectations, October 2015-May 2018. 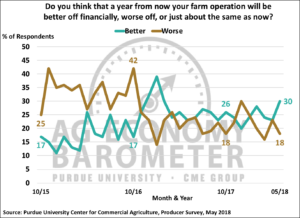 Over time the percentage of respondents reporting that their farms’ financial condition is worse than a year earlier has drifted lower as has the percentage of respondents expecting further deterioration in the year ahead. On the May survey, 36 percent of respondents reported that their farms’ financial condition was worse than a year earlier, down 5 percent from a month earlier and the lowest percentage reporting worsening financial conditions since the survey began in October 2015. When asked to look ahead 12 months, the percentage of producers expecting their farm to be in worse financial condition a year from now fell to 18 percent in May, down from 23 percent a month earlier. Responding to the same question, the percentage of producers expecting their farm to be in better financial shape a year from now rose from 23 percent in April to 30 percent in May, the highest percentage since February 2017 (Figure 3). Figure 3. Percentage of producers that think a year from now their farm will be better off or worse off than now, October 2015-May 2018. At least part of the sentiment improvement detected on the May survey is attributable to producers improved perspective regarding how the U.S. agricultural economy is likely to perform, both over the course of the next 12 months and the upcoming five years. Looking ahead 12 months, 32 percent of producers expect good times in U.S. agriculture, up from 25 percent a month earlier. When asked to look ahead 5 years, 51 percent of respondents said they expect good times in U.S. agriculture compared to 44 percent who felt that way in April. The improvement in sentiment regarding the U.S. agricultural economy could be a function of a relaxation in international trade tensions with China compared to a month earlier when nearly one-fifth of respondents expressed concern that U.S. agricultural exports will decline over the next five years. The improvement in overall sentiment on the part of producers had little impact on their perspective regarding whether now is a good or bad time to make large investments on their farms. Responding to this question on the May survey, 27 percent of producers said now is a good time to make large farm investments compared to 28 percent who felt that way in April and 67 percent of respondents said now is a bad time to make large investments compared to 69 percent who responded that way one month earlier. This month’s survey included several questions related to the Farm Bill debates taking place in Congress. 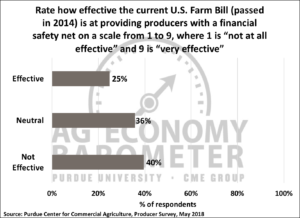 First, producers were asked to rate how effective the current U.S. Farm Bill, passed in 2014, is at providing producers with a financial safety net (Figure 4). On a 1 to 9 scale where 1 is “not at all effective” and 9 is “very effective”, two-fifths of the respondents said the current farm bill was not effective (a rating of 4 or less) and just 25 percent of respondents said the current farm program provided an effective financial safety net (a rating of 6 or higher). To provide a frame of reference for these responses, when this question was posed in November 2016 and again in November 2017, 47 and 45 percent of those surveyed, respectively, thought the 2014 Farm Bill was not effective in providing a financial safety net. When asked more specifically for their evaluation of the current ARC-County and PLC income support programs included in the 2014 Farm Bill, only one-quarter of the respondents said these programs were effective (a score of 6 or higher) in providing a financial safety net and nearly one-third said they were not effective (a score of 4 or less) (Figure 5). Figure 4. Producer rating of effectiveness of current U.S. Farm Bill in providing producers with a financial safety net, May 2018. Figure 5. 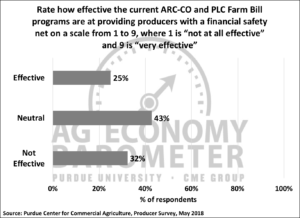 Producers rating of effectiveness of ARC-County and PLC programs in providing producers with a financial safety net, May 2018. Possible revisions to the crop insurance program are also an integral part of Farm Bill discussions. In an effort to learn more about farmers’ perception of crop insurance, producers that purchased crop insurance in 2018 were asked to rate the effectiveness of the current crop insurance program in providing a financial safety net on a 1 to 9 scale where 1 is “not at all effective” and 9 is “very effective”. 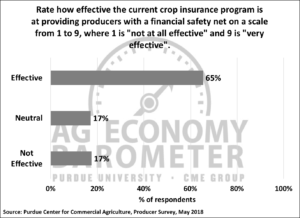 Nearly two-thirds of the respondents indicated that crop insurance is effective (score of 6 or higher) while just 17 percent of respondents said it was not effective (score of 4 or less) (Figure 6). Figure 6. Producers rating of effectiveness of crop insurance in providing a financial safety net, May 2018. To learn more about what would happen if the crop insurance subsidy structure changes, producers that purchased crop insurance in 2018 were asked what they would do if next year’s crop insurance premium increased by 50 percent. A majority of respondents (54 percent) said the premium increase would cause them to change the insurance product or coverage level that they choose. One-fifth of the respondents said they would not make any change in their insurance coverage in response to a 50 percent premium increase. However, it is interesting to note that just over one-fourth (26 percent) of respondents said they would not purchase crop insurance next year if their cost increased by 50 percent (Figure 7). Figure 7. Producer response to a 50% increase in next year’s crop insurance premium, May 2018. Ag producer sentiment improved markedly in May as the Ag Economy Barometer rose to its highest reading since January 2017. The increase in the sentiment index was driven both by an improvement in producer’s perception of current conditions and, especially, by a more optimistic view of future economic conditions. Compared to April, producers were more optimistic about the U.S. ag economy over the course of the next year and the upcoming five years. A relaxation in trade tensions between the U.S. and China could account for some of the increase in optimism about the U.S. ag economy. Responding to several questions related to farm program legislation, only 25 percent of producers in this month’s survey indicated the current farm program provides an adequate financial safety net. Farmers have a much more positive perspective of the current crop insurance program, however, as two-thirds of respondents that purchased crop insurance in 2018 indicated crop insurance does provide an adequate financial safety net. 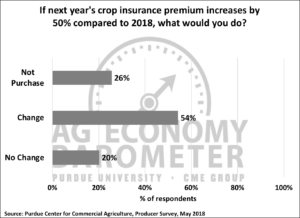 Finally, when asked how they would respond if their crop insurance premiums next year increased by 50 percent, over half of respondents said they would change their crop insurance coverage and 26 percent said they would not purchase crop insurance in 2019.